John Paul Beard (fourth from the right) flanked by his fellow NASA-sponsored project teammates. 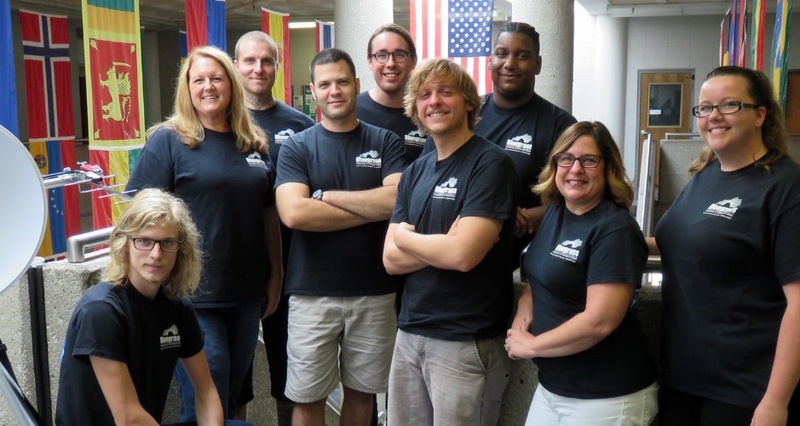 Father’s Pride: My son John Paul Beard is mentioned in this news story for his role as the Logistics Coordinator on the Balloon Sat Team consisting of students and faculty from the Kentucky Space Grant Consortium at Bluegrass Community and Technical College (BCTC). It’s not very often we get the urge to stare directly at the sun, but on Monday many community members may find themselves tempted to do just that. For the first time since 1991, an estimated 391 million United States residents will be able to view a total solar eclipse in partial or total form, according to NASA. Solar and lunar eclipses occur when the earth, sun and the moon align. Though the total eclipse will not be visible in Jessamine County — it will be visible in Paducah — residents will still be able to enjoy the excitement of a partial eclipse. The start of the partial eclipse will be around 1:02 p.m. and the maximum eclipse will be around 2:30 p.m. The celestial event should be over around 3:54 p.m., according to NASA’s website. During this time, several places in Jessamine County will be hosting viewing parties. Jessamine County Public Library will show two hours of NASA Television’s show, “Eclipse Across America: Through the Eyes of NASA,” with unprecedented live video of the celestial event from 1 to 3 p.m. The Wilmore Senior Community Center will host a live stream of “The Great American Eclipse” at 2 p.m.
A Bluegrass Community and Technical College student from Wilmore, John Paul Beard, will play a role in the making of the live stream. Beard will be the Logistics Coordinator on the Balloon Sat Team consisting of students and faculty from the Kentucky Space Grant Consortium at Bluegrass Community and Technical College (BCTC). To read entire Jessamine Journal article, click HERE.